They are a rehashed version of the tax cuts the government announced last year. It has simply increased the modest amounts already slated to be delivered in July, handing up to $1080 to anyone earning between $48,000 and $90,000. But the bulk of the Liberals’ tax cuts don’t start kicking in until 2024—beyond the election after this one. They would eventually impose a flat tax structure that would see an executive on $195,000 pay the same marginal rate of tax as a low paid worker on $45,000. The bulk of the benefits go to wealthy Liberal voters on big incomes—in another handout to the rich. Labor called their bluff by opting to increase tax cuts for low income earners on under $40,000, and opposed the Liberals’ broader tax plan for the rich. The Coalition are also throwing money at local infrastructure projects they claim will reduce congestion in cities—all so they can make plenty of funding announcements in marginal seats during the election campaign. All up another $42 billion is going to infrastructure spending over four years. Treasurer Josh Frydenburg went out of his way to talk up how fair the government was being, including funding for mental health, pre-schools and medicines. But the budget did nothing to seriously address climate change—there is just the reheated Tony Abbott-era Emissions Reduction Fund. And the budget revealed that the Liberals will provide only a pathetic $189 million for it over the next four years. This has further exposed their main mechanism to deal with climate change as a farce. There was also $129 million to extend the punitive cashless debit card that is used to control the money of people on welfare, overwhelmingly in Aboriginal communities. And the $185 million spent to open Christmas Island detention centre just so Scott Morrison could stage a press conference. And the government has taken $1.6 billion from the NDIS, saying it hasn’t been spent due to slower than expected uptake of disability support plans. Yet instead of spending the money to help fix the scheme the government has put it towards its budget bottom line. In an effort to claim the high ground on economic management, the Coalition also boasted about getting the budget back into surplus. They haven’t actually delivered one, but say it should arrive next year—based on projections. For its part, Labor wants to compete about who has, “the more fiscally prudent offering”, as Shadow Treasurer Chris Bowen put it, promising larger surpluses than the Liberals. This carries the danger of cuts if the economy gets worse. The Liberals’ election campaign is based on the claim that everyone will benefit from a strong economy—which they say they can deliver. This only proves how out of touch they are. Thanks to the Liberals, most of the benefits of economic growth are going to big business, not to workers. Average wages have been growing at barely above the inflation rate—meaning many workers are going backwards. Since mid-2016 wages have risen just 8 per cent but profits went up by 43 per cent. 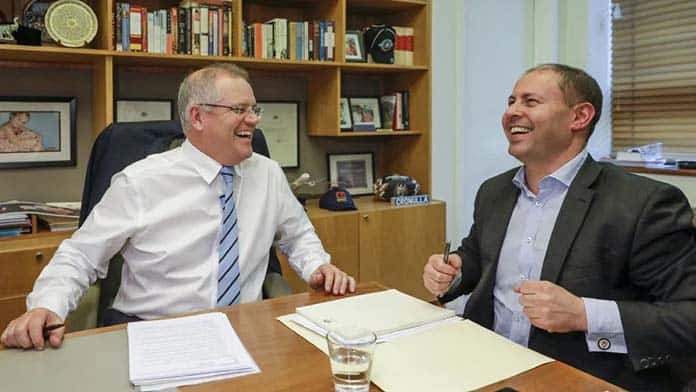 So it’s not surprise that, even while polls say the budget in general was well received, the three polls run by Newspoll, Essential and Ipsos all show the Coalition continues to trail Labor at least 48 per cent to 52. That’s enough for a crushing election defeat. Labor leader Bill Shorten has tried to tap the concern about pay by declaring the election a “referendum on wages”. Labor would instruct the Fair Work Commission to determine what a “living wage” should be, and then recommend how this could be phased in to increase the minimum wage. But it will be allowed to take into account, “the capacity of businesses to pay, and the potential impact on employment, inflation and the broader economy”. So don’t hold your breath. Labor is also committed to overturning the cuts to penalty rates and a number of other industrial relations changes. But workers at Chemist Warehouse have shown how it’s possible to win big gains on pay and to reverse casualisation—staging a 16 day strike. The best thing Labor could do to back wage rises would be to unshackle the unions through giving us the right to strike and to pursue industry wide bargaining. The fight for that will have to continue beyond the election.